​Direct primary care takes the insurance portion out of your basic healthcare so you can have consistent, affordable, transparent care when you need it without added stress, worry or unexpected billing. We can provide a better care experience by NOT billing insurance. Have you ever wondered why it’s so hard to see your doctor when you need to see them? Have you ever walked out of an appointment, only to remember there’s something you forgot to address? Did you wish you could just email or call or text? Have you ever tried to get an answer about how much a health-related service would cost? Have you ever wished you could ask your physician a question without a 3 week wait, massive phone tree or costly visit? Have you ever been surprised by bills, months after you received care, that you thought were going to be covered, but weren’t? Direct Primary Care (DPC) is a new approach to paying for basic health care services. 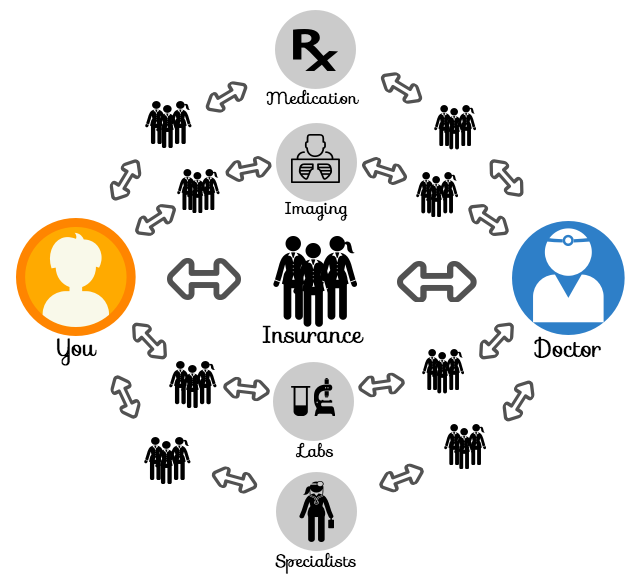 ​– It is estimated that 40% of dollars spent on primary care are lost to the system (insurance administration). For predictable care, Simply Direct Health just makes sense. 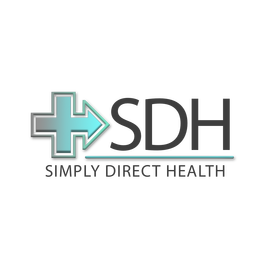 SDH is a new, more personal approach to Family Medicine . Did you know that most Primary Care Physicians have between 2,500-3,500 patients? Simply Direct Health limits our practice to no more than 700 patients. This means that your doctor can spend more time with you when you need it. It also means that when we are not actively seeing a patient, we are able to coordinate your care and research the latest advances in treatments. Your well-being is our priority, and the reason for why we do what we do. Simply Direct Health does not accept insurance so you won’t have a middle-man in your primary care. Decisions about your healthcare will be made by you and your doctor, without the impersonal management that inevitably comes from third-party payers. Instead, patients pay a monthly membership fee which can save money and lead to better treatment. You’ll be able to reach us and your medical information via internet, e-mail and text. ​It’s all about you, and your specific goals for wellness. A physical exam will be done, and appropriate tests will be ordered. We will also make sure you are up to date with all recommended health screenings. For example, minor suturing, cryotherapy, and skin biopsy are all included in your membership fee. If there is an extra charge for a service, you will know exactly what it is before proceeding. There are special labs and procedures that may require an additional fee. Our members receive a discounted wholesale price for these services. If you require an in-person consultation for specialty medical care, our doctor will work closely with that specialist. Because we are not obligated to any certain network in the area, the choice is made together with you to get you the best doctor to meet your needs. Option 1: By Itself As an individual, you don’t have to go without care because of the lack of insurance. 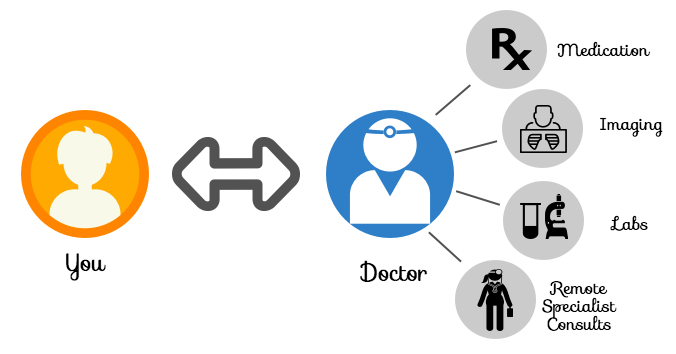 90% of medical needs for 90% of the people can be managed through primary care. We recommend that all members have some type of insurance coverage for the unexpected, however it is not required. As an Employer, offering Direct Primary Care as a stand alone benefit will help reduce out-of-pocket costs for employees who have purchased their own plans. 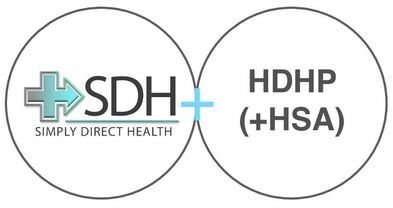 Option 2: Paired with High Deductible Health Plan (+ HSA)Pairing Simply Direct Health with a high deductible health plan allows for coverage for catastrophic events while providing concierge level quality and access to primary care services. Switching from a “Silver” or “Gold” level plan to a “Bronze” plan will typically save well more than the amount of membership at Simply Direct Health and significantly reduce out-of-pocket expenses incurred over the year. Adding an HSA account will allow for tax deferred payment for incidental medical expenses like labs, prescriptions, supplements, imaging, and payment toward the high deductible if necessary. Option 3: Paired with a medical cost-sharing plan (can provide savings) Medical cost-sharing is an ACA-compliant alternative to health insurance. 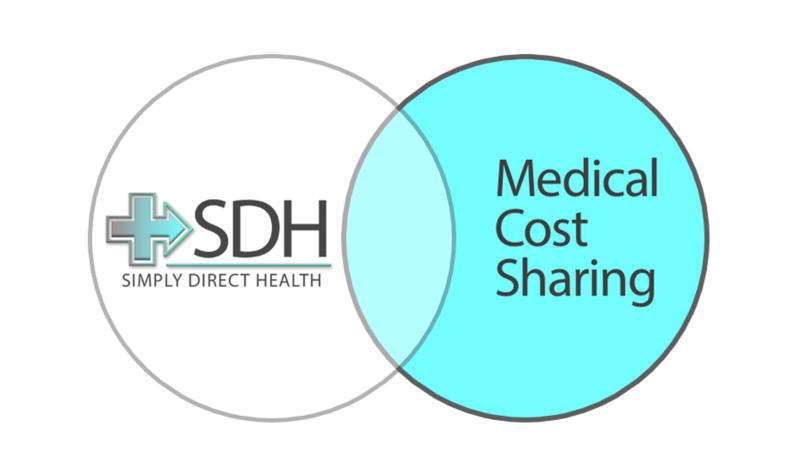 In this option the medical cost- sharing organization would help pay for medical expenses incurred outside of Simply Direct Health. ​ Are you sick of seeing your insurance premiums skyrocketing? Ever wonder why you have to pay so much money for health insurance you feel like you never use? Ever wonder if there’s an alternative way to bypass this financially binding ACA requirement? Well, now you are in luck. At Simply Direct Health, we have flipped healthcare upside down and have found ways to save you money, not only with your primary care needs, but specialty care, labs, imaging, procedures and NOW even health insurance! As a Primary Care clinic, we think insurance is absolutely necessary. We are confident we can take care of 80% of your health care needs, but we may not be able to cover 100%. We can’t fix your broken hip, your heart attack (although we do our best to PREVENT them), your unfortunate cancer, your car accident injury or your strokes, which is exactly why health insurance is needed. Insurance is needed to “INSURE” against risk. Primary Care needs are NOT risk, they are routine. The analogy to your car insurance/homeowner’s insurance/life insurance continues to hold true. You wouldn’t insure your car to get an oil change, to get gas, to wash your windows, so why would you insure your health care for a low-cost stuffy nose, cough, congestion, uncomplicated infections and chronic disease management? However, there are times where insurance is necessary. We want to bring to your attention to alternative plans where the current ACA system, we feel, is financially restrictive for most people in the working middle class (and upper class and lower class and all classes for that matter). ENTER into a Health Sharing Plan. What are health sharing plans? Health Sharing Plans are alternatives to mainstream insurance plans that offer ‘per event’ coverage for medical complications that occur outside the scope of Primary Care. WHO PROVIDES HEALTH SHARING PLANS? These are health sharing plans that are NOT insurance, but ARE ACA exempt. Will a health sharing plan help save me money? Each of these non-profit companies has it's own unique plan, but the overall premise is a low premium (Usually about $300-$500/mo) with deductibles ranging from $500-$3000.They function on a ‘per event’ basis. For example, if you have a medical need that is less than $300, it would be your responsibility. If that need exceeds $500-$3000, you would submit that information to the health sharing plans for reimbursement that is shared among other members. The monthly premium is shared with those that have need. The mindset that you are a healthy family and sharing the cost burden of those chronically ill around you makes it challenging to continue paying >$1,000/month premiums for health insurance that you don’t use. The majority of Americans will not hit a $3,000 deductible during the year and even less will meet a $5,000 deductible. ​​WHAT ABOUT THE ACA COMPLIANCE ISSUE? I need health insurance to avoid a fine, right? Again, the above Health Sharing Plans are ACA Exempt. Your tax accountant can show you the forms to fill out to state your exemption. In addition, Pres. Trump had recently signed legislation lifting the ACA Fine. These options are great ways for uninsured people to maintain ACA exemption, while having catastrophic coverage opportunities. They are great for small businesses to offer added incentives for fractions of the price of traditional health insurance. These work perfectly in our system of health care where we take care of your primary needs for a low monthly membership fee and anything requiring specialty care, you can utilize these resources. These work great for large, self-insured companies on a similar vein. We have found that these alternatives to health care really opened our eyes to finding affordable health care and we are happy to work alongside these organizations in offering you the best, most affordable health care possible. ​Dr. Kirby and Jordan were recently featured in a documentary about Direct Primary Care that is out on Amazon right now called "Healthcare Unmasked." ​It is a documentary helping patients understand the power of cash in health care and that Health Insurance doesn't equate to Health Care.